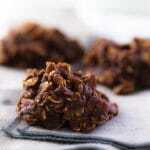 No-Bake Chocolate Oatmeal Cookies - Lightened up but just as good! 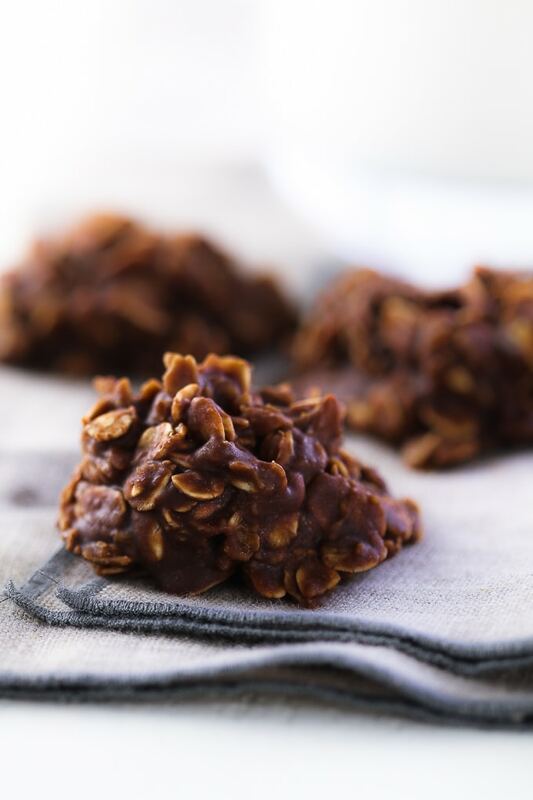 Made by substituting half the sugar with Swerve sweetener and using powdered peanut butter, these no-bake chocolate oatmeal cookies are lighter than the original recipe but tastes just as good! After a recent test kitchen session that yielded a reduced-sugar icing that left me almost speechless, I immediately started thinking about other treats I’d been wanting to makeover. These classic no-bake chocolate oatmeal cookies from my childhood were the first ones I thought of. I have fond memories of being at my Mawmaw Ween’s house as a kid and getting to try out all kinds of homemade goodies. Like me, she served up love in whatever could be baked in a pan. But not *everything* she shared was a baked good. I remember as a small child her making these no-bake chocolate oatmeal cookies and me loving every bite. As I got older, I don’t recall her making them that much. Maybe it was the fat phobia of the ’90s that pushed them out of her kitchen. I’m not really sure. But I am sure that if she were alive today, my remake of this classic cookie would pass her taste test. You’ve probably noticed by now that my standard go-to sweetener in my recipes is a combo of half sugar and half Swerve. As I explain on most every recipe I share with you, I do this because it both cuts the sugar in half AND passes my family’s own taste test. I’m a fan of reducing sugar in recipes as much as possible but NOT at the sacrifice of great taste. This combo seems to work every time. 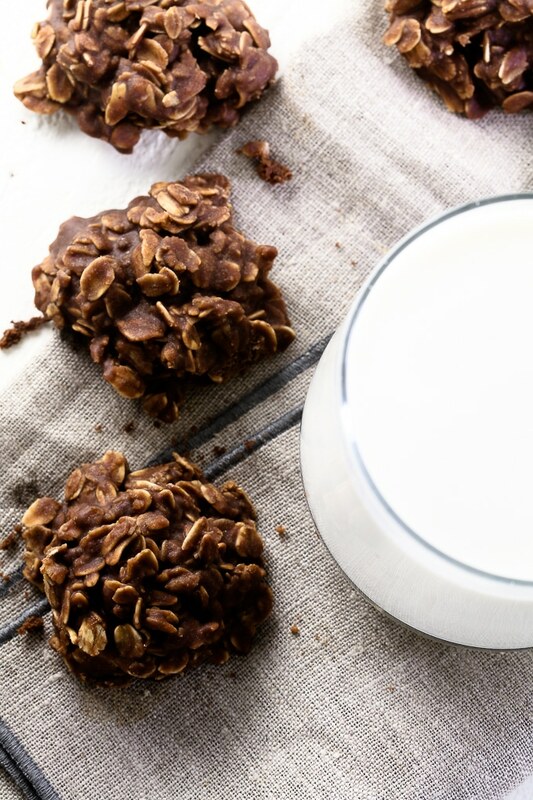 And in this particular recipe, I opted to use powdered peanut butter for these no-bake chocolate oatmeal cookies, which also trimmed the calories a smidge without sacrificing taste. Melt butter in a large saucepan over medium-low heat; add milk. Whisk together sweetener*, cocoa, powdered peanut butter and salt; add to butter mixture and stir until smooth. Turn heat to medium and cook, stirring occasionally, until mixture comes to a full boil. Boil for one minute, stirring occasionally. Remove from heat. Add in vanilla and oats; stir until combined. Drop by heaping tablespoons onto a parchment or Silpat lined baking sheet. Let cool and store in an airtight container. Wondering if this would taste ok with a plant based milk instead of regular milk – I have been drinking Milkademia and Good Karma Flax milk with Protein – for both, I get the unsweetened. What is your opinion? If they hold up well during cooking, I would think they would work. If you try it, let me know!